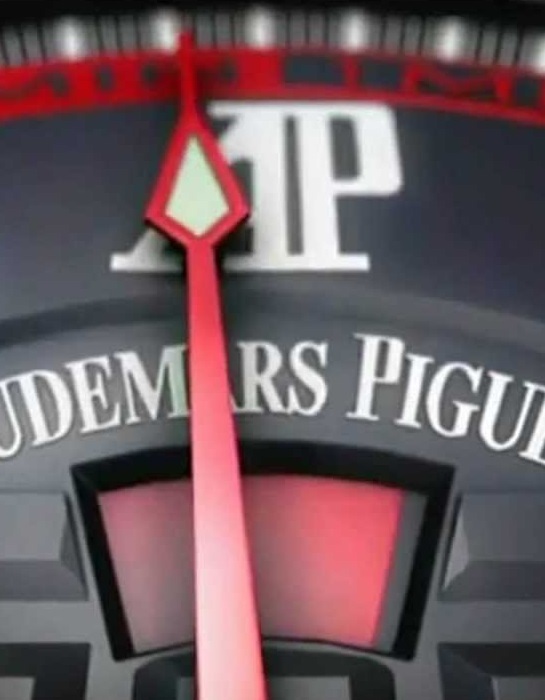 In 1875 Jules Louis Audemars and Eduard Auguste Piguet decided to join forces, in order to develop and craft watches equiped with complex mechanisms. 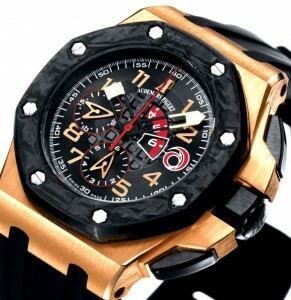 Together they shared a passion for watchmaking and soon the Audemars Piguet brand was born. The company survived some hard times in the history of watch making, by developing interesting watches like the Royal Oak series, the world’s first high-end sports watch in steel. From 2002 until 2007 Audemars Piguet has been sponsoring the Swiss sailing team Alinghi. 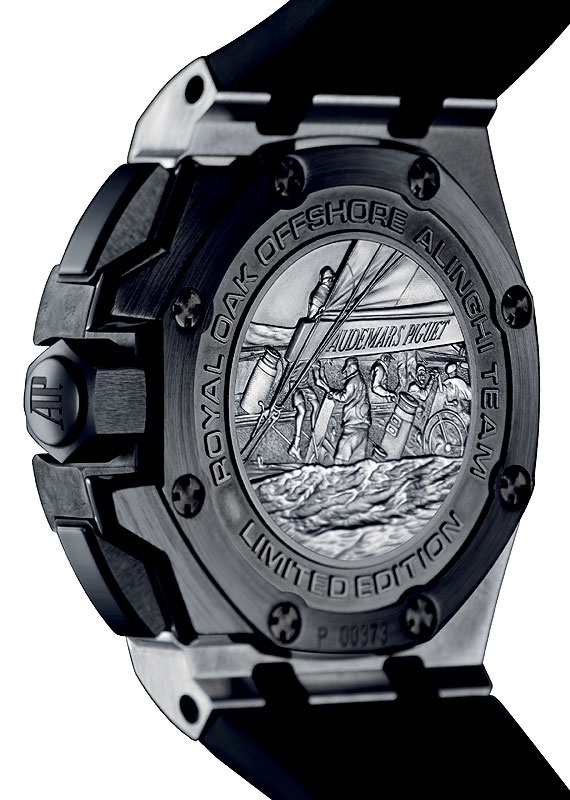 And the victory of the Alinghi at the America’s Cup in 2003 inspired the brand to design an innovative chronograph watch, the Royal Oak Offshore Alinghi Polaris Chronograph , launched in 2005 as a limited edition of 2000 pieces. 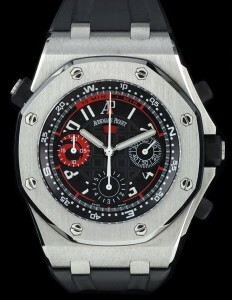 Royal Oak Offshore Alinghi Polaris Chronograph, with a last minute indicator. Model: Audemars Piguet Roal Oak Offshore Alinghi Polaris Chronograph. Reference: 26040ST.OO.D002CA.01 with a stainless steel case and a rubber strap. 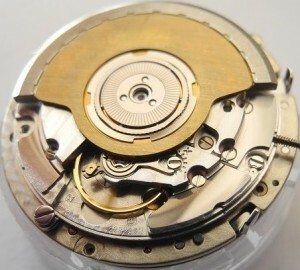 Caliber: automatic AP 2326/2847 movement. 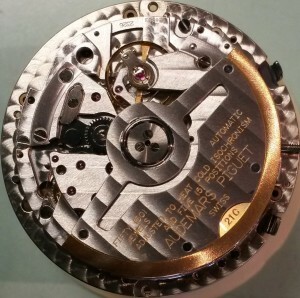 (Jaeger LeCoultre 896 with an integrated Dubois-Dépraz 2847 regatta module). Case size: Ø 42 mm / H 14,7 mm. The Royal Oak Offshore Alinghi Polaris Chronograph has a special new movement by Dubois-Dépraz featuring a flyback function and a 10-minute regatta countdown with a last minute aperture in the dial at 12 o’clock. 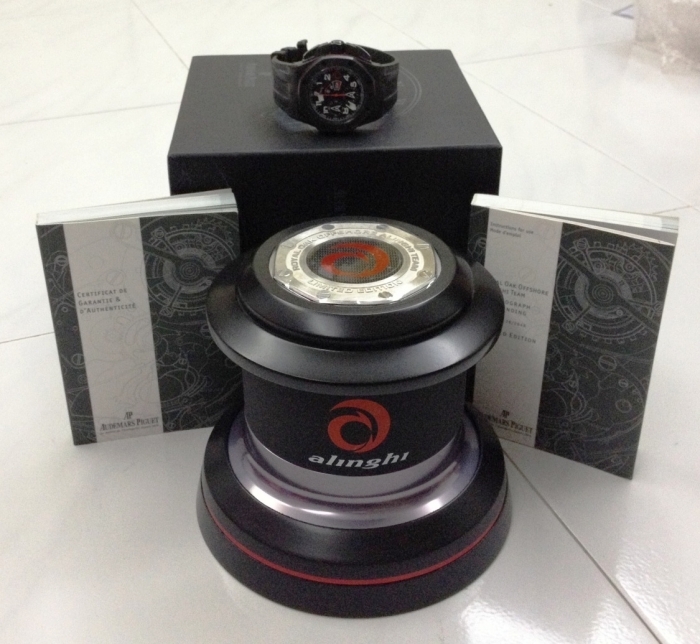 The black dial wears the bright red Alinghi logo in the 20-minute register at 9 o’clock. It has a turnable compass ring inside, set by the button at 10 o’clock. 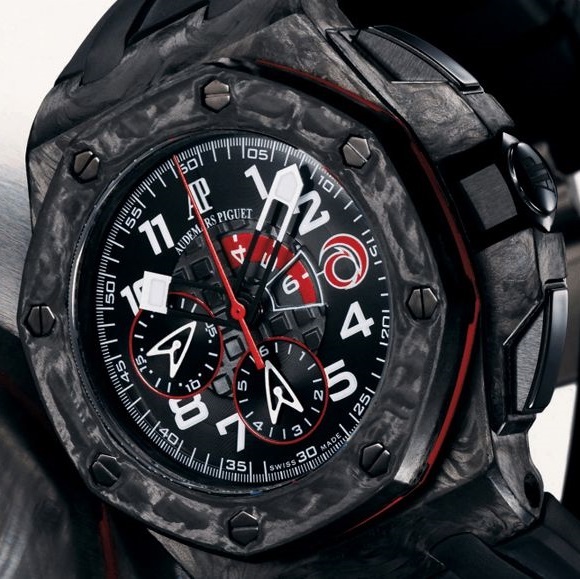 Lightweight and strong were the key words for both the designers of the Alinghi yacht, and for the new Royal Oak Chronograph. 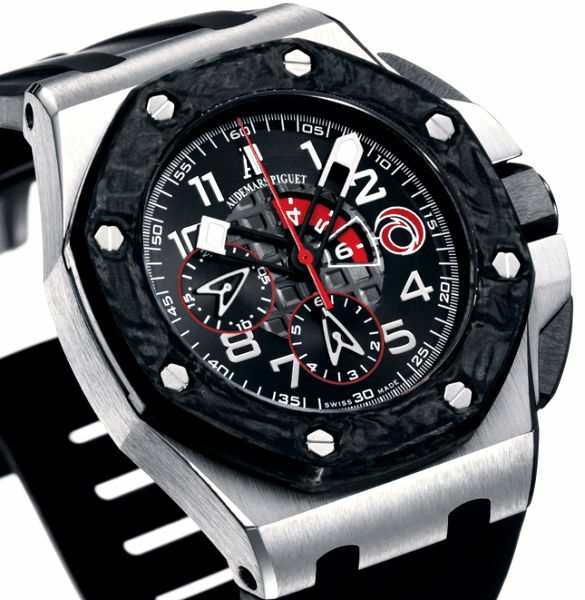 With this in mind the choice for carbon fibre was made, and so the new 2007 Royal Oak Offshore Alinghi Team Chronograph was introduced as the first ever watch with a case and bezel both made from forced carbon fibre. There were also versions with the case made of rose-gold or titanium, and only the bezel made from forced carbon fibre. The series was limited to 2007 pieces in total. In 2010 the Alinghi did win the America’s Cup for the second time! Roal Oak Offshore Alinghi Team Chronograph in platinum, carbon and rose-gold case. Model: Audemars Piguet Roal Oak Offshore Alinghi Team Chronograph. 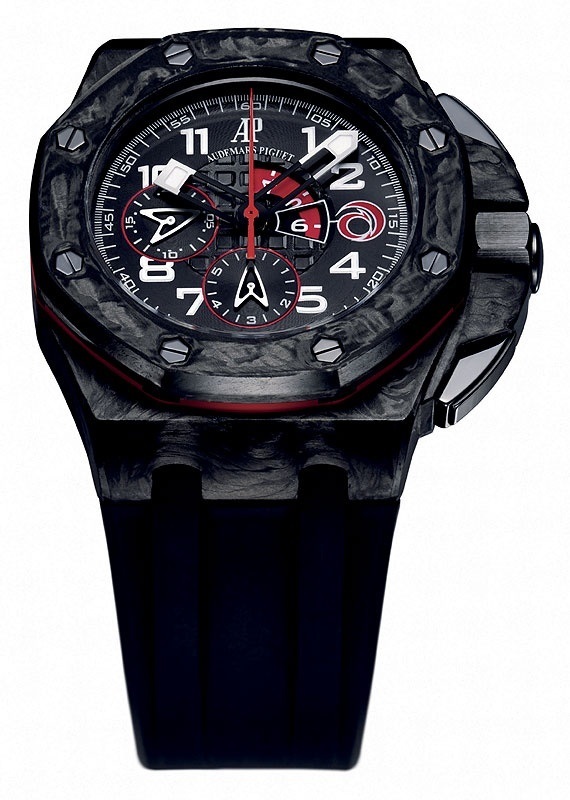 Reference: 26062PT.OO.A002CA.01 with 950 platinum case and carbon bezel. Rubber strap. Limited edition of 107 pieces. 26062FS.OO.A002CA.01 with carbon case and bezel. Rubber strap. Limited edition of 1300 pieces. 26062OR.OO.A002CA.01 with 18k rose-gold case and carbon bezel. Rubber strap. Limited edition of 600 pieces. Caliber: automatic AP 2326/2848 movement. (Jaeger LeCoultre 899 with an integrated Dubois-Dépraz 2848 regatta module). Case size: Ø 44 mm / H 14,3 mm. As the Royal Oak Offshore Alinghi Polaris Chronograph is driven by the AP 2326/2847 movement, the new Royal Oak Offshore Alinghi Team Chronograph features the AP 2326/2848 movement. 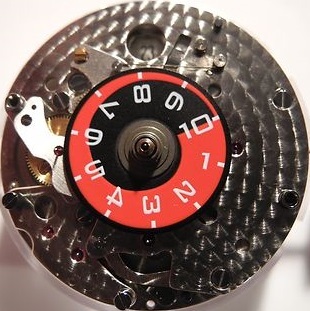 The first one has a third subdial with a small seconds at 3 o’clock and a little window for the indicator disk at 12 o’clock, where the window slowly turns red during the last minute. 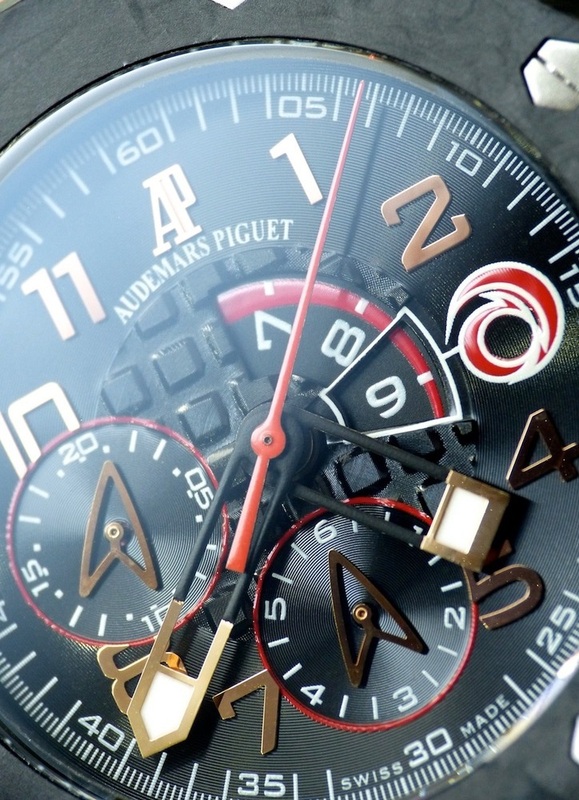 The second one does not have the small seconds subdial, but an aperture in the dial between 12 till 3 o’clock showing the 10-minute countdown. 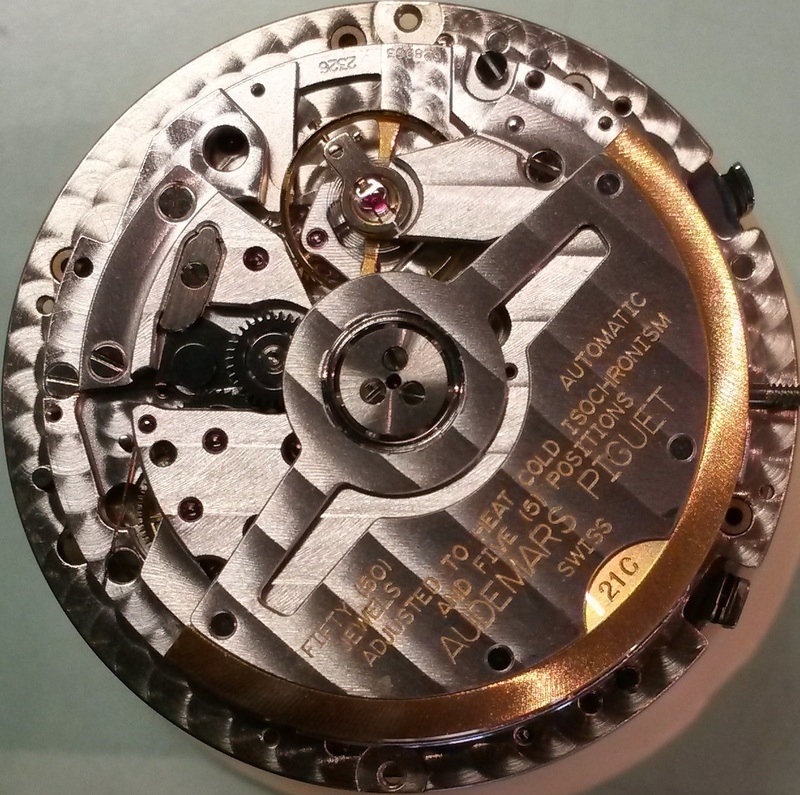 Both movements have a Jaeger LeCoultre base caliber (896 and 899) with a 10-minute Dubois-Dépraz (2847 and 2848) regatta module integrated. 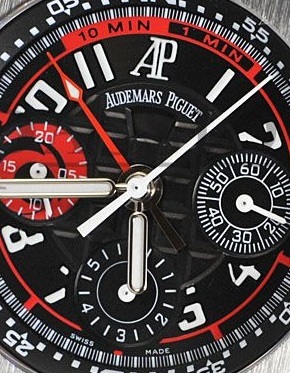 Although the picture of the Royal Oak Offshore Alinghi Team Chronograph movement shows a date window at 12 o’clock, there’s no date showing on the dial. How the countdown function works. 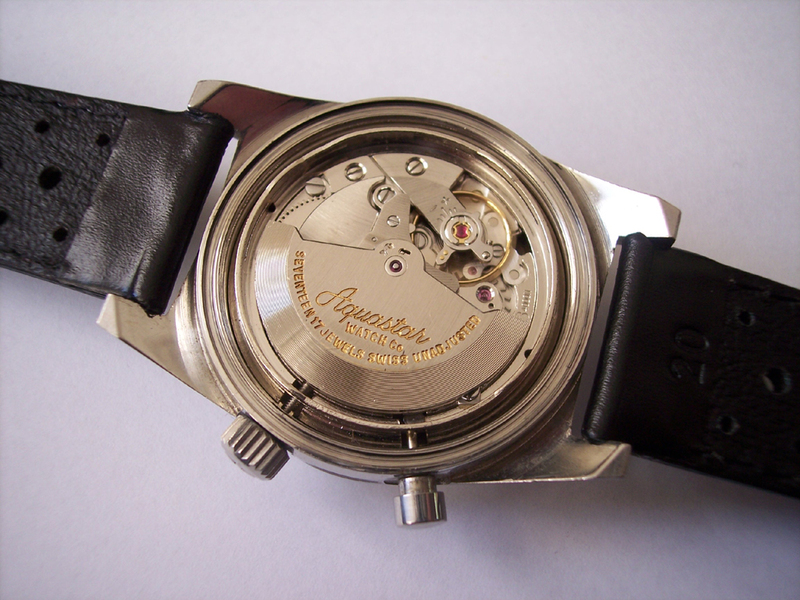 The automatic 2326/2848 movement features instant-restart and countdown functions. At the first flag, 11 minutes before the start, the pusher at 2 o’clock sets off the red hand of the chronograph seconds. At the 10-minute gunshot, the pusher at 4 o’clock zeroes and restarts the chronograph. The countdown window then displays 10, while the centre-seconds hand embarks on its one-minute tour of the dial. At the five-minute gun, the count-down window and the 20-min­ute register at 9 o’clock both show 5. At one minute to start, the countdown window displays 1 on a red background. Finally, at the starting gunshot, the count-down window shows 10 for the second time while the minutes­ counter indicates 10 for the first time. If you want to know exactly how the countdown function works and learn some more about the brands history, you can read the instruction manual here. Size: 11,5″ Ø 26 mm / H 7,3 mm. Shock protection system: KIF Elastor. Base caliber is a Jaeger Lecoultre 899 with a DD 2848 regatta module integrated. 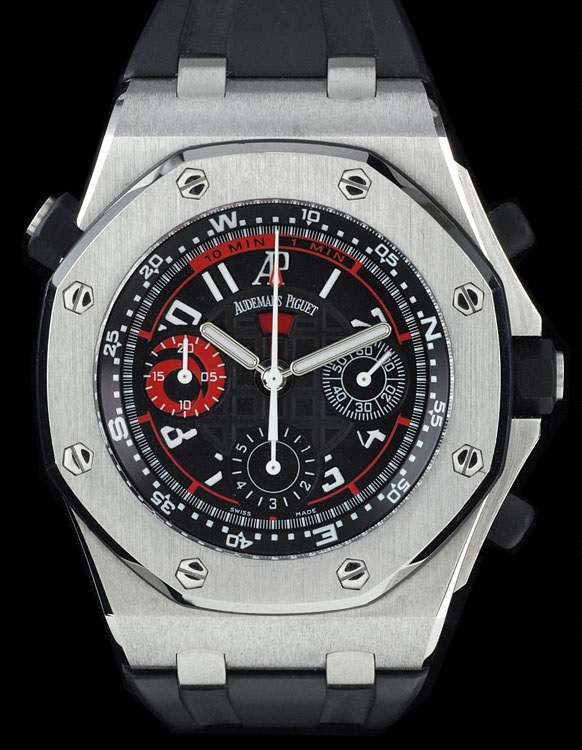 Both Audemars Piguets yachttimers, the Royal Oak Offshore Alingi Polaris Chronograph and the Royal Oak Offshore Alinghi Team Chronograph , were sold with a big box in the shape of a yachts winch. Alinghi watch box in the shape of a yachts winch. many thanks to Frank Hettich for your information about the AP movements. Sales from sailes, by Paolo Mariani © Watch Around 2013.